Published our Member Brochure, listing all members both alphabetically and categorically. . The brochure cover features local photography solicited through a contest we have each year. Host our Annual Dinner in January and 2-3 Business After Hours throughout the year. Maintain a dynamic Website, www.trentonchamber.com, and Facebook page, Trenton, NY, Area Chamber of Commerce. We now have the ability for current members as well as new members to pay dues online. 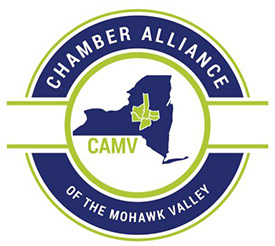 Participate with the Chamber Alliance of the Mohawk Valley, CAMV, in monthly meetings and supporting initiatives put together by the CAMV on State wide issues concerning our Business Community. Awarded $1,000 Endowment to one of our members, 2019 was our 10th annual Endowment. Created a "Member Spotlight" feature add in our local paper, The Rural Star. Each issue spotlights 1-2 of our member business's or organization. The Trenton Chamber of Commerce functions on a volunteer basis, everything we provide for our members is accomplished by member's volunteering their time and efforts. Member participation is encouraged and welcome, there are many ways you can offer your time and services. Plan to attend our monthly meetings if you can, we want your input and participation in making this organization work for you.